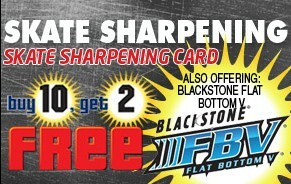 Buy 10 sharpenings get 2 FREE! Stop in the store to get yours today! Recreational, competitive, and professional skaters from all over the country bring their skates to Bertelli's Skate Shop to receive the best sharpening service around! Our staff members are experts at ice skate sharpening, and the shop has all of the proper ice skate sharpening tools to get the job done right. Buy 10 sharpenings get 2 FREE! Stop in the store to get yours today! Recreational, competitive, and professional skaters from all over the country bring their skates to Bertelli's Skate Shop to receive the best sharpening service around! Our staff members are experts at ice skate sharpening, and the shop has all of the proper ice skate sharpening tools to get the job done right.